It can be expensive to purchase, but it costs just pennies to make at home! I'm talking about the tart and sweet, naturally effervescent and refreshing, immune-boosting drink we call Kombucha. It's one of my family's favorite beverages. Interested in fermenting more of your own foods? While you're here, be sure to grab our free fermenting formulas cheat sheet that will give you proportions and ingredients for all kinds of ferments — from salsas and relishes to krauts, jams, and beverages. Grab it here. Once you get the hang of making kombucha, it's fun to play around with flavors to go along with plain. I achieve this by adding flavorings to my bottled kombucha and giving it a second fermentation. I use quart or liter-size swing top bottles for most of my flavored kombucha. First I add the flavorings to each bottle, and once my gallon of the initial kombucha has finished, I decant it into the bottles. Then those flavored bottles are set back on the counter for two more days while the kombucha absorbs the flavors and ferments away the sugars. Also, a little goes a long way. One pear or one apple will flavor an entire gallon of kombucha. Here are five fun flavors to try this fall. Some are spicy and reminiscent of a delicious dessert, while others are fruity and tart. The smaller the fruit pieces, the stronger the flavor will be. Finished kombucha will have a fizzier kick if you use pineapple, ginger, or strawberries. Here in Florida, with temperatures still in the 70s and 80s Fahrenheit, I use a shorter fermenting time. Adjust this according to your own climate. Greater fizz is also achieved by filling bottles nearly to the top — thus eliminating most of the air space. Use high-quality bottles able to withstand the pressure that builds up during fermentation. Perfect for fall! The ginger gives this a wonderful fizzy kick. Add all ingredients to a clean quart bottle. Fill with plain kombucha and leave only small space at the top. Seal tightly. Cover and allow to ferment in a quiet place for 2 to 3 days. Fill to the top with plain kombucha. Cover and allow to ferment in a quiet place for 2 to 3 days. Spicy and reminiscent of a delicious dessert. Apple pie in a drink? Yum! 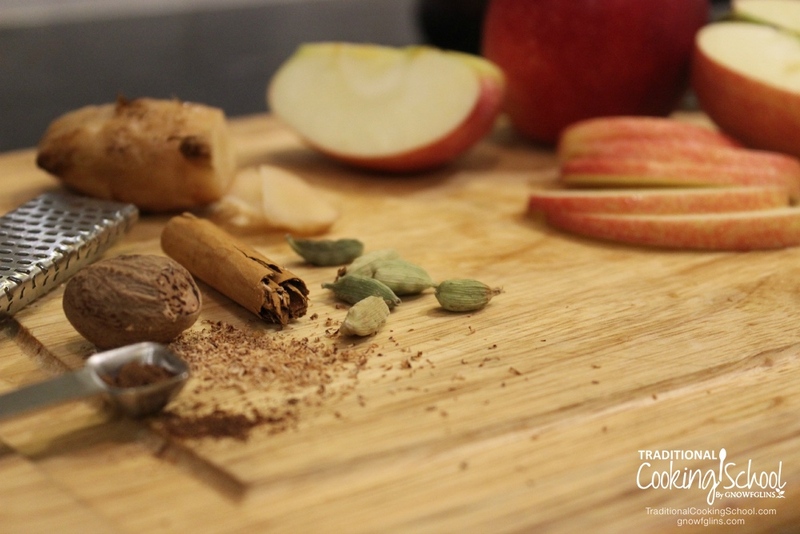 *Use a sweet apple variety such as Honeycrisp or Gala. Fruit salad in a glass! Makes 1 quart/liter. 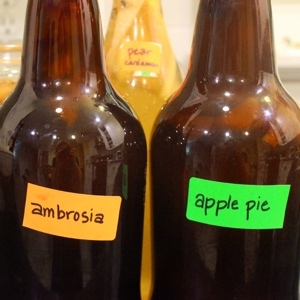 Here are two more flavor ideas for your kombucha: a vanilla/cinnamon/apple flavor and a ginger/grapefruit flavor. What are your favorite Kombucha flavors? Lee holds a Masters in Music Education from Florida State and was a band director in her past life. 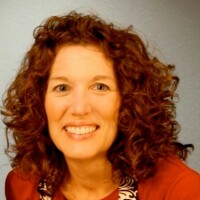 Married to her college sweetheart for over 26 years, she has been homeschooling their two children for the last 9 years. A lifelong foodie, her real food journey got a kickstart when her sister took her to hear Sally Fallon speak on Nourishing Traditional Foods in 2007. Together with her sister, she produced a DVD on making nourishing traditional breads using the soaked flour method. Today Lee is co-leader of her local WAPF chapter, and teaches about real food and alternative health topics to her local community. She is busy pulling out the shrubs from her home in the suburbs of Orlando and replacing them with edible landscaping. She also blogs at Well Fed Family, shares videos on the Well Fed Family YouTube channel, and interacts on all the usual social media networks: Facebook, Twitter, and Pinterest. I cannot wait to try some of these! I’ve been flavoring my kombucha with cherries and blueberries lately, and this will be a welcome, seasonal change! I especially love the idea of adding pineapple to it! I have been blessed to drink many of Lee’s different kombucha flavors – her kombucha is the best I have ever had! I can testify that these recipes are fabulous! These sound sooooo good. I am looking forward to trying these soon. 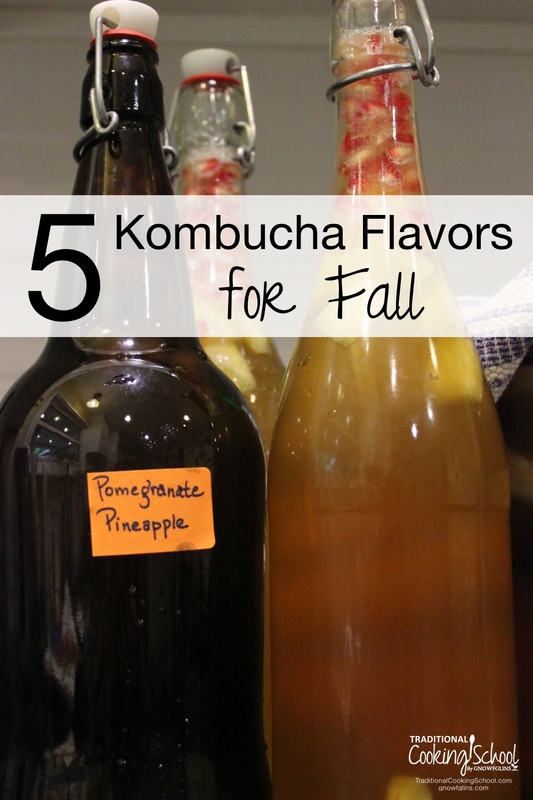 I have a batch of kombucha brewing now that I am going to flavor with one of these recipes. My usual flavor is a mix of blueberries, raspberries and ginger. I have never tried Kombucha. Can you describe the taste? I know it is fermented sweet tea. I have heard it described as sort of a cider. I am thinking of trying it but it’s an investment and I am not sure I will like the taste. Thanks for any information you can give me. Some people describe kombucha as tasting like champagne. To me it is a little like a very tart bubbly cider. 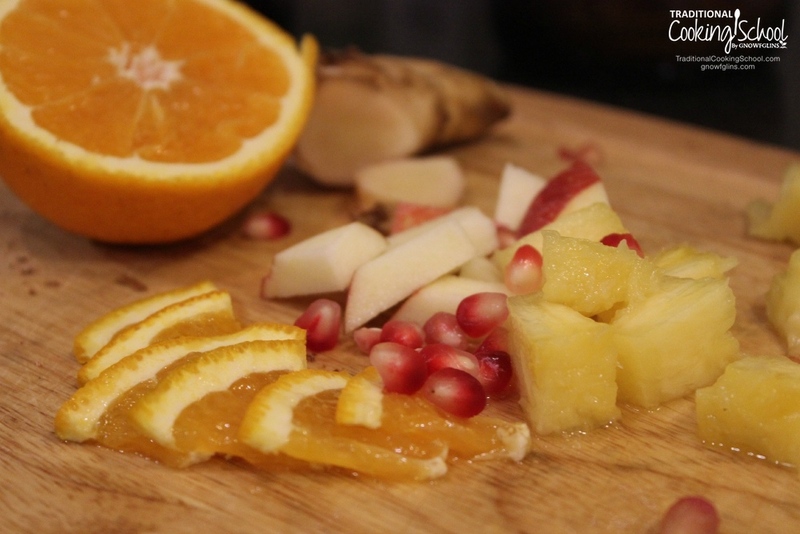 When you add flavoring ingredients such as in this recipe then you also taste those flavors in addition to the plain kombucha flavor. If you like vinaigrette salad dressings, dill pickles, or tart lemonade you will probably like kombucha. Purchasing store bought kombucha is a great way to see if you like it. I tell people to start with an easy-to-find brand like GT’s and choose a flavor like grape or strawberry to start with. The store bought stuff is so expensive compared to making your own, so if you do like it then by all means get a scoby and get brewing! I have been making continuous brew kombucha for over a year now and have learned that doing the second brew of your flavor of choice makes for a refreshing drink of what ingredient you have added. However if you overbrew the kombucha it will have a vinegar taste which you do not want. I do have a temperature strip on my vessel but the temperture in the house determines how soon I need to remove the kombucha for my second flavor fermenting and replace with a new batch of sweet tea. You get into a pattern and it becomes just part of what you do. It is worth the effort and it does become easier when you don’t need to read “the recipe” every time. The scoby will grow and you will need to separate your scoby and those extra ones can be kept (lookup scoby hotel). Also you can make you own apple cider vinegar with the extra scobys lookup that too. Good Luck, Get Started and Happy Brewing! Is it okay to use quart mason jars or similar jars to store kombucha? Does it change anything besides the overall fizziness? Quart mason jars are fine. I would use the small mouth rather than wide mouth size. The fizziness will definitely be less, especially if you don’t drink the whole quart right away. The smaller neck flip-top bottles seem to store better if you want to drink a little at a time and keep the flavor and fizz fresher. Maybe you can use smaller pint-size canning jars so that you have a more single-serving size container. In any case be sure the tops are kept tightly closed. 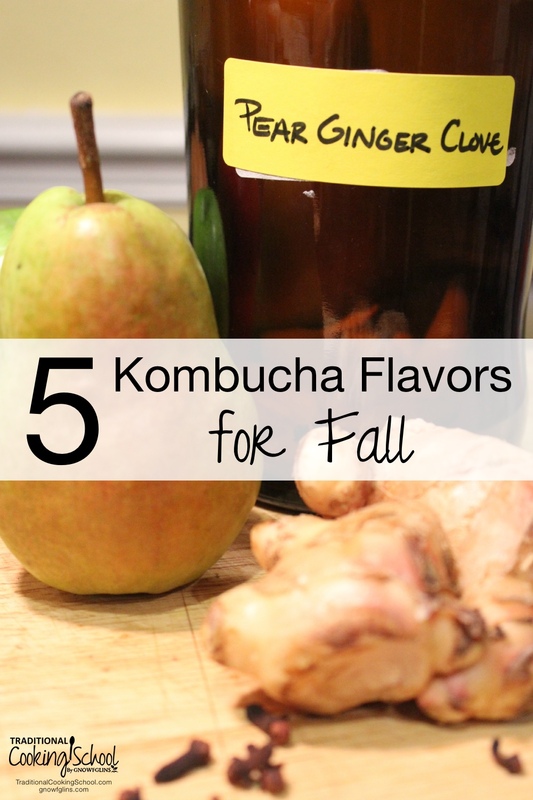 My favorite fall Apple Cider Kombucha! Oh my it is simply delicious! For 2nd ferment, I use 1 part apple cider to 3 parts kombucha. Perfect that way or Some times I throw a few pieces of candies ginger in with a tablespoon of turbinado sugar to the apple cider kombucha.